Glorious God, Yahweh, you are worthy of our praises! We worship, praise and glorify your name because your majesty is forevermore. Even if we were to search the deepest parts of the world we will find none like you, you are truly the Omnipotent one. EZE (King), GLORIOUS GOD be thou magnified. Proverbs 17:9 says, “He who covers and forgives an offense seeks love.” You have to cover that offense. You have to forgive. It doesn’t belong to you. It didn’t originate with you. That offense came from that situation. It belongs to that person. It is not yours unless you take it in. It is only yours to forgive and to cover. The Scripture doesn’t say that offenses won’t come, but it tells us how to deal with an offense—cover it and forgive. The choice is ours. We can either seek and go after love or we can go after the offense. An Australian, Greek woman who went through horrible abuse and trauma in her life shares how as A believer our past does not need to be our future. Jesus sets us free of our past. She shares how God rescued her and how He wants to rescue you, but will you let him? All rights belong to church of the highlands. Cindy Jacobs is a prophet, speaker, teacher, and author with a heart for disciplining nations in the areas of prayer and the prophetic. She and Mike, her husband of 43 years, co-founded Generals International in 1985. They also founded the Reformation Prayer Network, which consists of a large fifty-state coalition of prayer leader. 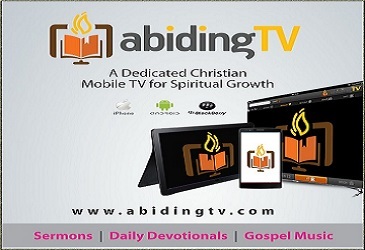 Your victorious and triumphant life from glory to glory is dependent on your knowledge and application of God’s Word. You must stand on the Word of God for yourself. God gave us His Word to live by; you can be, have, and enjoy all God has destined for you, if you’d live by His Word. God never said your miracle will occur on the basis of the multiplicity of prayers. What He wants is for you to be in control of your life, through the Spirit. It’s one of the reasons He gave you His Word, and the Holy Spirit. If you’d live according to God’s Word, you wouldn’t need a plethora of prophets praying for you before you can walk in God’s blessings. Acting on the Word is what you need. The Bible clearly reveals the potency and efficacy of God’s Word. His Word is absolute reality, and all you need to keep experiencing victory and promotion in life is living by the principles of God’s Word, for we’re Word practitioners; we’re Word-doers. For example, the Word says you’re righteous; believe it and affirm your righteousness, irrespective of Satan’s accusations or feelings of condemnation that you may sometimes have. Declare that you’re blessed, highly favoured, and prosperous in all things, because the Word says so. Hallelujah! To effect the changes you desire in your life and circumstances is simple: once you’re sure of what the Word says about the issue, demand a change on the basis of God’s Word. This isn’t about prayer; it’s about acting your faith to walk in God’s provision for you! It’s about standing on the Word of God for yourself. Dear Father, my faith is in your Word, and it prevails even now, over circumstances. I excel and make progress today in all that I do, because I walk in the light of your Word—in wisdom, righteousness, prosperity, and divine health. Your glory fills my life, in Jesus’ Name. Amen.
. . . Forgetting the past and looking forward to what lies ahead. As we flick the calendar to a new year, we come face to face with the fact that our days on earth are numbered. As the Psalmist wrote, “Teach us to number our days, that we may apply our hearts unto wisdom.” No thoughtful person can approach New Year’s Day without some introspection. We are reminded of the brevity of time. We also look back over our failures, mistakes, and missed opportunities, and vow that we will make better use of our time during the coming year. We should take time to be pleasant, to smile, to extend the small courtesies we often omit—to show love to our family. Psychiatrists tell us that most people are starved for love. Take time for the goodbye kiss; we shall go to work with a sweeter spirit. Let us take time to get acquainted with our families. We are not machines. We are not robots. The secret of a happy home is that members of the family learn to give and receive love. Let us take time to express our love in a thousand ways. 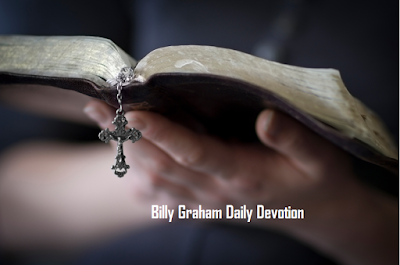 Listen to Billy Graham’s audio message about numbering your days. Time is short. Make a decision to accept Christ today. As I begin a new year, Lord Jesus, I pray that my walk through the days ahead will be filled with Your love for others, a love that does not count the cost. Beloved. You have entered My Secret Chamber of Revelation. I am the Door that leads to all Truth. You are My Child and also My Confidant. This is your heritage, Dear One, through your new birth. My mysteries are revealed to you by My Spirit. At one time, no man could know these things. It was too much to comprehend without the Spirit of God living in them. But for this reason, I have sent My Spirit into your heart. And now, Beloved, you and I are the most intimate of friends. As a Bridegroom and His Bride should be the best of friends, so are we, Beloved. I am He who sticks closer than a brother. The Veil no longer keeps you from My Glorious Presence. It is for you to know the Secret of My Presence. You shall hear My Voice and discern it from all others. Does not the Bride listen for her Beloved's Voice. And does He not speedily answer her? Oh yes, Dear One. I am He who never leaves you nor forsakes you. I am He who will forever commune with you and guide you. You shall be a living witness that your God talks to men. There is no care that you cannot cast upon Me. There is no need for which you cannot seek Divine Relief. You have entered into the Holy of Holies by the Blood of the Lamb. Though you may not possess a degree from the world of men, to you I have given the hidden treasures of wisdom and knowledge. To you, the seven spirits of God are revealed and at work in you. The Spirit of the Lord. The Spirit of wisdom and understanding, the Spirit of counsel and strength, the Spirit of knowledge and the fear of the Lord. Come away with Me, My Beloved and My Friend. Walk with your Father, your Bridegroom and your Best Friend for awhile. Your Teacher no longer hides Himself, but your eyes will behold your Teacher. Your ears will hear a word behind you, "This is the way, walk in it," whenever you turn to the right or to the left. The knowledge of the mysteries of the Kingdom of Heaven have been opened to you." Confidant:one to whom secrets are entrusted; especially intimate ones. ...Psalm 25:14 The secret counsel of the LORD is for those who fear Him, and He reveals His covenant to them. ...Colossians 2:2That their hearts might be comforted, being knit together in love, and unto all riches of the full assurance of understanding, to the acknowledgement of the mystery of God, and of the Father, and of Christ, 3 In Whom are hidden all the treasures of wisdom and knowledge. 4And this I say, lest any man should beguile you with enticing words. ...Isaiah 30:21 He, your Teacher will no longer hide Himself, but your eyes will behold your Teacher. 21Your ears will hear a word behind you, "This is the way, walk in it," whenever you turn to the right or to the left. ...Mathew 13:11He replied, “The knowledge of the mysteries of the kingdom of heaven has been given to you, but not to them." “God can do anything, you know—far more than you could ever imagine or guess or request in your wildest dreams!” (Ephesians 3:20 The Message). We know that setting goals is important because the Bible tells us that Jesus set goals. In fact, he often announced publicly what his goal was for the next phase of his ministry. So why should you set goals? Today we’re going to talk about three reasons to set goals, and tomorrow we’ll talk about three more. You need to set goals because it is a spiritual responsibility. If you don’t have goals for your life, you have already decided to let other people run your life. When you don’t decide in advance what’s important, you’re letting other people decide. You end up wasting your life, because you haven’t clarified how you want to grow as a follower of Christ. The Bible says that to be spiritually mature, you have to set your goals and move toward them as you keep your eyes focused on them. “I have not yet reached my goal, and I am not perfect. But Christ has taken hold of me. So I keep on running and struggling to take hold of the prize . . . I run toward the goal, so that I can win the prize of being called to heaven. This is the prize that God offers because of what Christ Jesus has done. All of us who are mature should think in this same way” (Philippians 3:12, 14-15 CEV). You need to set goals because they are statements of faith. Goals aren’t just a statement of faith. They stretch your faith. The bigger your goal, the more your faith will be stretched. And that pleases God. Ephesians 3:20 says, “God can do anything, you know—far more than you could ever imagine or guess or request in your wildest dreams!” (The Message). You need to set goals because they focus your energy. Focus is the key to an effective life. If you spread your energy out and diffuse it over a whole bunch of things, you’ll make no impact at all. But if you focus your life, it’s going to be powerful, and it will change the world. You don’t have time to do everything. But here’s the good news: God doesn’t expect you to do everything! The key to being effective in life as a follower of Jesus is to do what matters most and forget everything else. Goals help you maintain that kind of focus. “I do not run without a goal. I fight like a boxer who is hitting something—not just the air” (1 Corinthians 9:26 NCV). How do your goals reflect what you believe about God? Does your family set goals together? Why is it important to do this as a family? What things do you spend your time and energy on that may not really matter? As a follower of Christ, you are a new creation! You have a new spirit, a new walk, a new life! Are there “old” things" in your life that you are trying to get rid of? Maybe you have old behaviors or addictions that you want to change. Remember, the new is near. It’s a new year, and it’s time to be the new you. Let this year be the year you break old habits and addictions. Let this be the year that you move forward into a new life of victory. And your new life includes all the spiritual blessings the Lord has promised in His Word. You have a promise of peace, health, protection and provision. Be encouraged today and know that no matter what is happening in your life right now, you can embrace the new life God has prepared for you. Make the choice today to leave the old behind—leave behind old behavior, old thinking, old words. Embrace the new by faith, and you’ll move forward into the life of blessing the Lord has in store for you. Heavenly Father, thank You for making me new. Help me to understand Your plan for me so that I can fully embrace Your promises. I choose today to leave behind the old life and ask that You empower me by Your spirit today. In Jesus’ Name. Amen. Do you ever get really tired of doing the same old thing all the time? You want to do something different but you either don’t know what to do, or you are afraid to do the new thing you are thinking about doing? You often get into ruts. You do the same thing all the time even though you are bored with it because you are afraid to step out and do something different. You would rather be safe and bored than excited and living on the edge. There is a certain amount of comfort in sameness you may not like it, but you are familiar with it. God has created you to need and crave diversity and variety. You require freshness and newness in your life. As this year and this day come to an end, make a quality decision to step out into the new thing God has for you. And don’t forget to enjoy yourself! Prayer Starter: Father, thank You for the new and exciting things You have for me this coming year! Help me to boldly step out and obey what You put in my heart. I know that Your plans always lead to joy, fulfillment, and good things. In Jesus’ Name, Amen. But the fruit of the Spirit is love, joy, peace, long suffering, kindness, goodness, faithfulness, gentleness, self-control. Against such there is no law. As we come to the close of another year, I encourage you to meditate on the positive aspects of your life. Focus on a loving Savior who died to grant you eternal life walking streets of pure gold and on His Spirit, who empowers you to display the character of Christ. Open the Word of God and let it come alive in your life. Let it take root in your soul! The peace that comes from above is like no other. It is a peace that offers calm where chaos has been. Guard your joy. Happiness is fleeting, but the love of the Lord and the favor of God last a lifetime. Cherish each day for the priceless gift that it is. Time is running short. Gabriel's trumpet could sound at any moment, and we who are alive in Christ could be called up to meet Him in the sky. Nothing else needs to take place in Biblical prophecy to prepare this earth for the second coming of Jesus Christ. Are you ready to meet your savior face-to-face? If not, close out this year by asking God to forgive your sins and make your paths straight. And when you have set things right with your Savior, live, love and be happy, doing good to others. There is no better way until you are basking in the presence of the Most High God! Oh, fear the Lord, you His saints! There is no want to those who fear Him. The young lions lack and suffer hunger; but those who seek the Lord shall not lack any good thing (Psalm 34:910 NKJV). The Word of God is clear: those who seek the Lord shall not lack any good thing. Notice this verse does not say, “Those who seek what is in God’s hand shall not lack any good thing.” It doesn’t say, “Those who seek what God can give them shall not lack any good thing.” And yet there are believers who do this very thing. You never have chase down a good thing. The moment you seek the good thing, you disqualify yourself from this particular promise of God. Many people start off seeking God, and then get distracted when they see a good thing coming on the horizon. They lose sight of God, and at the same time they disqualify themselves from the promise. Stay focused and committed to letting God do things His way. Let God bring you the good thing you are believing for. If it is your good thing, He can and will bring it into your hand. You do not need to chase it down. When God puts something into your hand, no one can take it away. When God gives it to you, you can rest secure in the knowledge that no devil, no person, and no negative situation can rob you of what is rightfully yours. Give God the opportunity to show Himself strong on your behalf. His Word promises that if you seek Him you will not lack any good thing. So, let God do it His way. In fact, these three words, “It is finished,” come from one Greek word teleo. In the days of Jesus, a servant would use it when reporting to his master: “I have completed the work assigned to me” (see John 17:4). The word means, “It is finished, it stands finished and it will always be finished!” Perhaps the most significant meaning of teleo is how it is used by merchants: “The debt is paid in full!” When Jesus gave Himself on the cross, He met fully the righteous demands of the law. He paid our debts in full! My friend, the work is finished. The victory is won. Our enemies have been made His footstool. Our blessings have been bought by His blood! Live life knowing that there is nothing for you to do—only believe! It is finished! You don't have to be the best, the smartest, or the strongest for God to use you. He uses ORDINARY people every day to accomplish EXTRAORDINARY things. In this sermon, Pastor J.D. Greear from The Summit Church preaches on the calling for EVERY Christian. Gaining wisdom is a necessity to re-ordering one’s life. You have the authority to speak God’s Word and live in His promises! Each morning you wake up to a day which will include both opportunities to embrace and challenges to overcome. And you have a choice on how to deal with adversity. In my teaching series “Command Your Day”, you’ll receive scriptural basis for speaking God’s Word in every situation, creating the results that you desire and allowing you to claim His promises for your life! This is the 120th sermon preached in English on thecloudchurch.org. It was preached by Pastor/Missionary Evangelist Robert Breaker, who shows what the Charismatic or Pentecostal doctrine is and how it does not line up with what the Bible says, as it tries to apply to the church today what was given to the Jews and eventually ended. The God we serve is very result-oriented. He never does anything just for the fun of it, and so He created every one of us with a purpose in mind. Not one person on this earth exists without a special assignment. He expects our lives to yield pleasant results for Him. Unfortunately, many people live life on their own terms. They just glide through life without a specific divine goal; the wind directs them to the south and they go to the south, and the next minute, the wind carries them to the north and they follow. They do not live their lives with a purpose in mind, because they don’t value their existence. Prayer Points: Father, open my eyes of understanding to comprehend the specific assignment You have for me in life. I am ready Lord, please use me mightily. Open Heavens 2019 coming soon!!! and reviews from previous years of Open heavens, Thank you for reading Open Heavens 2018, Happy New Year!! Whoever wants to embrace life and see the day fill up with good, Here’s what you do: Say nothing evil or hurtful (1 Peter 3:10 MSG). T he New Year is only hours away and I’m sure you’ve had so much to celebrate and be grateful to the Lord for in the outgoing year. Of course, while some are celebrating and testifying about the year, some others may be feeling dejected, wondering why their lives were full of pain and suffering in the outgoing year, and then hoping that in the New Year, things will be different. Now, whether or not you had a fantastic, supernatural 2018, there’s hope for the future. You have to decide that you’re going to have an extraordinary 2019. God’s Word shows you how. If where you are right now isn’t where you want to be, it’s your responsibility to change things; and the tool for this is in your mouth! Our opening verse says if you want to have your days filled up with goodness and good things, use your tongue correctly. How do you want your life to be in the coming year? It’s up to you! Speak in line with God’s Word; in line with the experiences you want to have. It’s that simple. Your life goes where your words go; you journey in the direction of your words. Therefore, let your communication be wholesome. Don’t voice fear, uncertainties, and unbelief; affirm the Word. Practise this, and you’ll experience the blessings of the Word; your experiences will be in sync with the Word and the realities of the Kingdom life. Jesus said you shall have what you say (Mark 11:23). As you go into the New Year, one of the critical decisions you must make is to yield your tongue to the Word! Practise talking right, and watch your life consistently go forward and upward! My tongue is anointed to speak forth truths; truths relating to the Kingdom; truths of my heritage in Christ! I bless the Lord for a glorious New Year ahead, where I prosper exceedingly and triumph gloriously by the Word, through the Holy Ghost, in Jesus’ Name. Amen. we have felt his love . . .
Find out how much God loves you. I saw a Child of God walking down a beautiful Path and as they walked, treasures were pouring out before them. "Beloved. Do you know who you are in Me? Do you believe My report, My Child? Darkness no longer has dominion over you. The enemy cannot crush you, for the Lamb of God was crushed for you. I was oppressed and afflicted so that you could walk in victory. You are no longer under the curse, Dear One. You are My Blessed and Highly Favored Sons and Daughters. I was despised and rejected by men so that you are now accepted in the Beloved. Do not be afraid, Dear One. You will not be put to shame. You shall not be humiliated or disgraced. With everlasting Kindness I have compassion on you. Though the mountains are removed and the hills shaken, My Loving Devotion will not depart from you. I have raised you up and seated you with Me in realms of Glory and Majesty. You are a Child of God. I have clothed you in pure white robes of Righteousness, My Righteousness. I have given you My Name, My authority, and My Glory. Oh My Beloved. How I long for you to see that the enemy NO LONGER has dominion over you. I have called you by name; You are Mine! Your identity is in Me. My DNA runs in your veins. Oh, what a great Love I lavish upon you, My Bride. Forever I am pouring out upon you the beautiful treasures of My Kingdom. For I have made known to you the Path of Life. And here in My Presence, there is fullness of joy, at My Right Hand are pleasures forevermore." ...Isaiah 45:3 And I will give you treasures hidden in the darkness--secret riches. I will do this so you may know that I am the LORD, the God of Israel, the One who calls you by name. ...1 John 3:1See what great love the Father has lavished on us, that we should be called children of God! And that is what we are! The reason the world does not know us is that it did not know Him. 2Dear friends, now we are children of God, and what we will be has not yet been made known. But we know that when Christ appears, a we shall be like Him, for we shall see Him as He is. ...Psalm 16:11 You make known to me the path of life; in your presence there is fullness of joy; at your right hand are pleasures forevermore. ...1 Corinthians 1:30 It is because of Him that you are in Christ Jesus, who has become for us wisdom from God: our righteousness, holiness, and redemption. ...Galatians 3:13 Christ redeemed us from the curse of the Law by becoming a curse for us. For it is written: "Cursed is everyone who is hung on a tree." The Lord spoke to me this morning, and said many have been living like Cinderella. Thinking someone hijacked your six white horses and your golden carriage. Thinking the enemy has stolen, delayed and hindered every hope, dream and vision the Lord has given you. But the Lord sent me here to tell you. Not one dream, prayer, hope and vision has been stolen. And what you call delay, is simply God‘s perfect timing. And remember, as we change, so does what the Lord is doing in us. He is patient to wait on the fullness of what we are meant to become. The Lord is not slow to fulfill His promise as some understand slowness; but is patient with you, not wanting anyone to perish, but everyone to come to repentance (2 Peter 3:9). This journey is not just about you, but every path you will cross. The lives that will be changed by what the Lord has placed within you. So things must go according to his timetable, so no opportunities are lost. Where there is no vision, the people perish; but he that keeps the law, happy is he (Proverbs 29:18). What if you are carrying the vision and fire for another in your womb. And by crossing your path, the Lord releases another piece of the puzzle. So I say it again, “Wait upon the Lord, and he will lift your burdens.” His great love will see you through. Be willing to be delayed, so that another can realize success. I have not yet reached my goal, and I am not perfect. But Christ has taken hold of me. So I keep on running and struggling to take hold of the prize” (Philippians 3:12 CEV). Yesterday we talked about some reasons why you need to set goals. 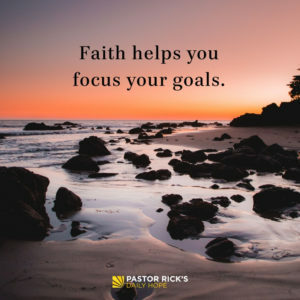 Today we’re going to talk about three more reasons why goal setting is so important that even Jesus set goals for himself. You need to set goals because they give you hope to keep moving and endure. Job says, “What strength do I have left that I can go on hoping? What goal do I have that I would want to prolong my life?” (Job 6:11 GW). You need a goal to keep you going. A goal doesn’t have to be big to motivate you. For instance, if you had to have surgery, your first goal in recovery could be to sit up in bed. Then you might work toward standing up and later walking down the hallway. All of those are small goals, but they’re all important, because to get from where you are to where you want to be isn’t one big leap. It’s many small steps. A goal doesn’t have to be big to be important—it just has to encourage you to carry on. You need to set goals because they build your character. The greatest benefit to your life will not be your accomplishments but rather what happens inside you while you’re moving toward your goal. God is more interested in your character than your accomplishments. 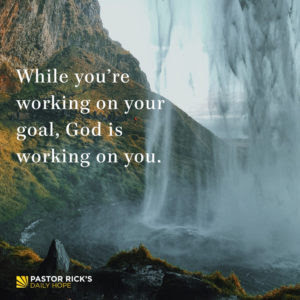 While you’re working on your goal, God is working on you. He is building your character, and that’s what’s going to last for eternity. That’s why Paul says in Philippians 3:12, “I keep on running and struggling to take hold of the prize” (CEV). It takes energy, effort, and purpose to reach your goal, and the result is that you become more like Christ. You need to set goals because good goals will be rewarded. Proverbs 11:27 says, “If your goals are good, you will be respected” (GNT). When you give your life to a good goal, it brings honor and builds a legacy on Earth. But the real reward in setting good goals is going to come in eternity. The Bible says in 1 Corinthians 9:25-26, “All athletes are disciplined in their training. They do it to win a prize that will fade away, but we do it for an eternal prize. So I run with purpose in every step” (NLT). Paul was a purpose driven goal setter. You need to be that, too, so that you can win the prize that God has prepared for you in heaven. If you’re discouraged today, set some new goals. What is something you can work for that will motivate and encourage you as you move closer toward your goal? What’s one thing you’ve learned about yourself as you’ve worked toward a goal? What’s one thing you’ve learned about God through that pursuit? How do your goals reflect what you hope and expect God will do in and through you?